Kim Kardashian West arrived in style Saturday at her pop up shop, with her mom Kris close by. After the event, as Kim walked out of Spago in Bev Hills, she told our photog she and Tristan Thompson were besties. Sounds like she buried the hatchet because she was furious at him after the cheating scandal. 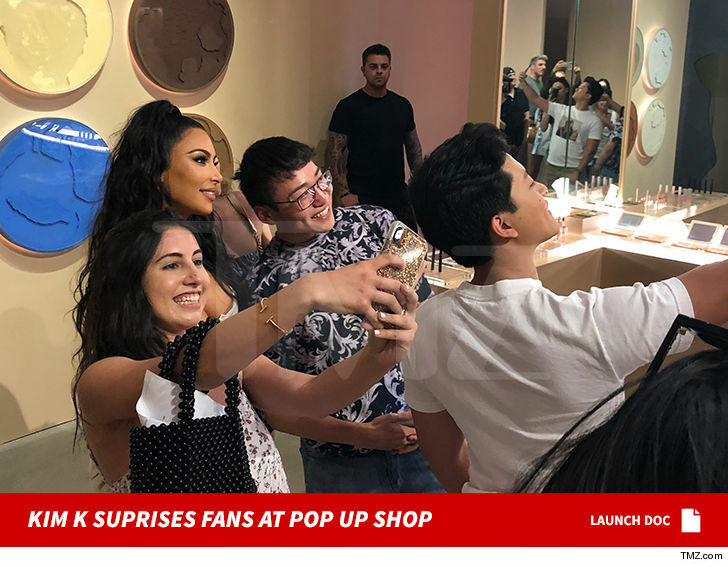 Kim showed up at the Westfield Century City mall in L.A. — which carries products from both her KKW Beauty and KKW Fragrance lines — to hang out with 50 lucky fans and their guests at a private event Saturday evening with her makeup artist, Mario Dedivanovic. Kim first went to her pop up where a few fans who were shopping got to meet her and take pics with her. Then she headed to a private rooftop venue to do one-on-one photos with a line of fans. The venue included an open bar and a candy station. We broke the story … Kim held a raffle for a chance to attend the celebration with her and Mario for free, and 50 winners were invited to attend. It’s a pretty big deal, too … fans usually pay hundred for Mario’s makeup tutorials.